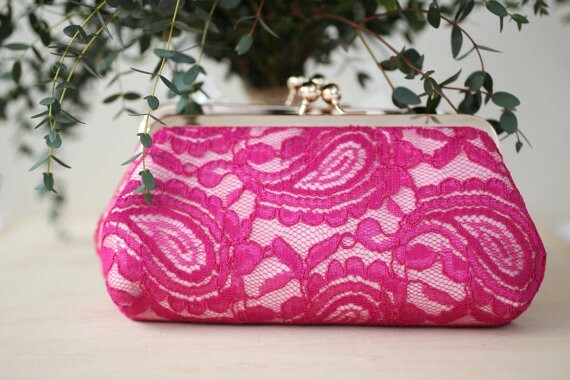 Fuchsia Lace Clutch Giveaway by ANGEE W.
Home | Giveaway: Win a Fuchsia Lace Clutch! 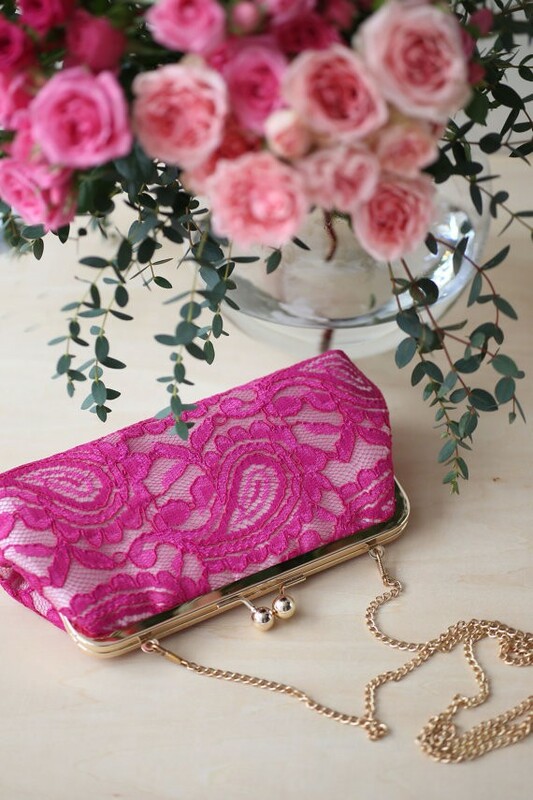 Giveaway: Win a Fuchsia Lace Clutch! 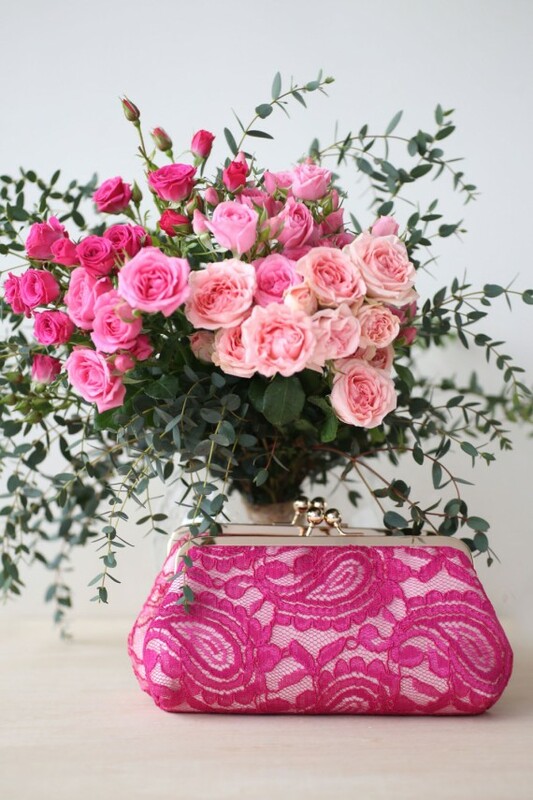 Win a Fuchsia Lace Clutch! This sassy fuchsia lace clutch is made with a layer of ivory Alencon parsley lace over blush satin. Perfect for brides and bridesmaids in an a blush or fuchsia dress! There’s a small inner pocket that would fit a Samsung Note or an iPhone, money or small change. The bag is padded and fully lined with a lining or with a photo lining. o Shipping: Winner pays shipping. Winner will receive an Etsy coupon code and must agree to pay $12 USD for US or Canada shipping or $24 USD everywhere else. A perfect match for my maids! The “Bridal Clutch with Pearl Sakura Flower Vine Lace in Blush Pink and Rose Gold” is my favorite. Gorgeous color and beadwork. Blush chiffon floral lace is my favorite! The metallic antique lace bridal clutch is beautiful! The White Bridal Clutch with rhinestones is my other favorite clutch because of the intricate rhinestone design and classic yet vintage aesthetic/design! The Navy Blue Sequins Tulle Clutch is lovely! Love these clutches! Can’t wait to order one for my Maid of Honor! Love the chiffon blush clutch! Bridal Clutch with Alencon French Lace Organza Flower and Freshwater pearls is my FAVE with the Photo or monogram lining!!!!! I really like the White Bridal Clutch with Rhinestone Geometric Brooch (lace cross) 8-inch PASSION ARTDECO. Even though it’s identified as a bridal clutch, I think it would be super cute with a dress for a bachelorette party. I would love the Shimmery Silver Clutch for Bride, Bridesmaid, Mothers. I love the 8-inch Metallic Antique Gold Floral Lace Clutch! The pattern is exquisite and it would look so lovely with my dress! I love the champagne and ivory alencon parsley lace clutch! Beautiful! Love the Metallic Antique Gold Floral Lace clutch! Metallic Antique Gold Floral Lace Clutch is perfect! White and Ivory Bridal Clutch Bag with peacock feather Pearl brooch is so beautiful. The amazing pop of color on the inside really adds some fun to it. The peacock brooch also adds a very nice touch to make it so amazingly beautiful. I LOVE the Vintage Japanese Obi Silk Travel Clutch!!! I love the bridal ivory lace clutch. I also think it’s amazing how you can personalize the clutches with photos, it’s such a neat idea! I love the gold brocade clutch. It will look great with my dress. Love the blush clutch with lace overlay and also the “peacock passion”. Lovely! The Navy Blue Sequins Tulle Clutch would match my bridesmaids’ dresses perfect! I love the Ivory Lace Bridal Clutch with Pearl Brooch! so chic! Giveaway: Win Custom Map Art! Giveaway: Win Burlap Toasting Flutes! Giveaway: Win Paper Flower Garland! Giveaway: Win Burgundy Earrings & Necklace! Giveaway: Win a Wedding Planning Book! Giveaway: Win a Burlap Print for Mom! Giveaway: Win FREE Wedding Invitations! Giveaway: Win a Rustic Hair Wreath! Giveaway: Win a Paper Bridal Bouquet!